If you have to interact with a police officer, you're probably not having a great day. And that interaction might leave the citizen with a big fine. It not too surprising when that driver doesn't race home to write a glowing review of the efficient customer service or drive away feeling great about police. At a time when many professional athletes are using sports as a platform to publicly criticize police, the San Diego Police Department is using sports as a way to connect police with the communities they serve. It's all being done through a program called Game Changer. Game Changer founder Sean Sheppard believes the breakdown in communication between the police and the public has a lot to do with time. "The key to any healthy relationship is quality time spent together," Sheppard said. Participants spend about three hours before a sporting event talking about issues between the police and the public. Then, they go see a game together. 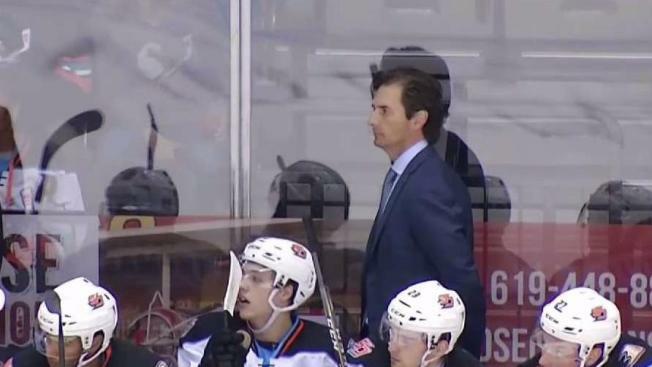 "If you know who I am and you know how I feel, and I know who you are and how you feel, we're going to get along much better," said San Diego Gulls coach Dallas Eakins. Eakins is an athlete himself, a runner, bicyclist and a hockey player. He loves sports for its power to bring people together. "There are thousands of people there and they're all there just to have fun and watch the game," Eakins said. "When I go out and take a look, I see young. Old. Different skin colors. I'm sure we've got different political parties. Different religions. And everybody's getting along. It's amazing." It's that togetherness that is the foundation for Game Changer. Eakins, who has been through the program, said it was fascinating to hear real emotions from cops. "To hear their emotions about how their heart rates get high, how they don't know what's around the corner or does this person in the car have a gun," he said. "You forget that these law enforcement people are human beings." Eakins met people like San Diego police Officer Melissa Link at a Game Changer event. She agrees that sometimes people forget the officer in the uniform is also a person. "I don't take it personally. This is the job that I signed up for, so I try not to take anything personally," Link said. "Sometimes people have bad days. Sometimes they don't like the police and that's ok."
She said after a Game Changer discussion, it's different. "We all go to the game together and we all find that one person that we wanted to talk to a little bit more or get to know more about, and you go sit next to them and you end up talking to them so much that you don't even watch the game," she said. It's those small connections Sheppard hopes to spread beyond San Diego. So far, the data shows the program works, Sheppard said. And San Diego police Chief David Nisleit has become a big fan of Game Changers. Among the 544 people who have participated so far, 94 percent of the civilians said their perception of officers improved because of the Game Changer workshop. The data analyzed by San Diego State University shows people who live in higher crime areas have worse perceptions of law enforcement than those who live in lower crime areas. When asked if revenue generation plays a role in the policing of certain neighborhoods, 31 percent of non-law enforcement participants indicated "Very True," while only 16 percent of law enforcement officers felt the same. Among Latino civilians, there was a big gap on perceptions between those who live in high crime neighborhoods versus those who live in low crime areas. The most pronounced improvement in perceptions after the event was among African American community members ages 14 to 25 years old with high school or some college as the highest education completed. "The whole concept of bringing law enforcement and the community together to have a very open and a very honest dialogue where there's no judgment was an incredible idea and something that inspired me very much," Eakins said. "It was the open dialogue of being raw and being honest," he added. "When I left the meeting, it was incredible because I thought a lot of good had been done." Or you could just learn more about Game Changer, here.